On a recent trip across Ontario to Indiana, I stopped by Sarnia to take some pictures of the large solar PV farm being installed outside town. When completed it will be one of the largest in North America. Sarnia is on the southern end of Lake Huron and north from Windsor Ontario. It is just across the river from Michigan. It is an old industrial area and the seat of the early Canadian oil industry. According to local lore, oil was discovered here prior to Drake's well in Pennsylvania. Today it remains a major center of oil refining and chemical manufacturers. The solar project was originally proposed by Opti-Solar under the Standard Offer Contract program. Opti-Solar had started contstruction on one of the several 10 MW contracts it had obtained from the Ontario Power Authority. Opti-Solar failed in the development of its technology and had installed only one MW of its first 10 MW plant when it sold rights to the project to First Solar. To my knowledge, First Solar is building two 10-MWAC projects using its inhouse thin film product. Canadian Hydro Developers is either the owner now or will be when the project is complete. Because the contracts are in kWAC the 20 MW project is likely rated at 23 MWDC. There has been heated debate about this and other large solar PV farms on prime ag land so I thought I'd visit one and see for myself. At least in this case, the project is on the peri-urban fringe of Sarnia with suburbs, stripmalls, malls, and assorted detritus of North American sprawl swallowing the existing ag land. My impression was that this particular project area would have become another mall or something similar and was destined to be bulldozed within a decade. The site was also near a landfill and if the parcel didn't become a mall it could have become a landfill. Nevertheless, it was farm land prior to construction and its now fast becoming one of the largest, if not the largest solar PV farms in North America. Sarnia solar PV farm with First Solar thin film panels. This project will be one of the largest, if not the largest, in North America. 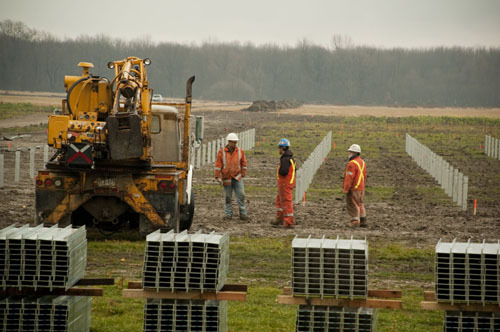 Installing the posts for the racking that will support First Solar's thin film panels near Sarnia, Ontario. This project will be one of the largest, if not the largest, in North America.